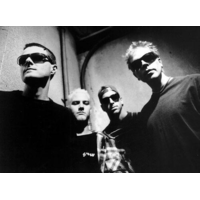 The Offspring is an American punk rock band formed in Huntington Beach, California in 1984. Since its formation, the band's line-up has included Dexter Holland (lead vocals, guitar), Noodles (lead and rhythm guitars, backing vocals), and Greg K. (bass, backing vocals). In 1987, Ron Welty replaced James Lilja as the drummer for The Offspring, completing the band's most successful lineup that would last for 16 years. Their current drummer Pete Parada, formerly of Face to Face and Saves the Day, joined the band in 2007, after Atom Willard decided to leave to focus on Angels & Airwaves. After releasing their first two albums, The Offspring (1989) and Ignition (1992), The Offspring achieved moderate success with Smash (1994), now having sold over a million copies and going platinum six times. As a result, the band was widely credited, alongside fellow California punk bands Green Day and Rancid, with popularizing and reviving mainstream interest in punk rock in the United States. The critical praise given to Smash garnered attention from major labels, including Columbia Records, with whom The Offspring would eventually sign in 1996. Their first album for Columbia, Ixnay on the Hombre was released in 1997 and was well received by critics. The Offspring continued to achieve success with their three follow-up albums, Americana (1998), Conspiracy of One (2000) and Splinter (2003), reaching multi-platinum, platinum and gold status respectively. The band's eighth studio album, Rise and Fall, Rage and Grace, was released in 2008. They are currently recording their ninth studio album, which is due for release sometime in 2011. The Offspring has sold over 45 million albums worldwide, making them one of the best-selling punk rock acts of all time. Each album since the release of Smash has sold over a million units.